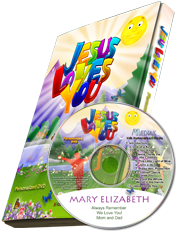 This personalized DVD is a collection of 10 praise songs and verses personalized with your child's name 41 times! Cheery, picturesque scenes and animated woodland characters combine with live action dance scenes that invite children to sing and dance along. This is the same music collection from our very popular personalized music CD with the same name.